Following its acquisition of Emporium Hotel in January, award-winning Ovolo Hotel Group is continuing to stamp its mark on Queensland’s capital, this month revealing a major multi-million-dollar evolution of the iconic property which will see it become the flagship Queensland hotel for the group. Ovolo The Valley will debut in November, however the Ovolo Hotel Group is already accepting bookings online for stays effective immediately. The project by acclaimed global architecture firm Woods Bagot, the award-winning designers behind the revitalisation of Brisbane’s Howard Smith Wharves and The Ivy in Sydney, will take Emporium into the new era with a hotel theme inspired by the eclectic culture and iconic history of Fortitude Valley. Ovolo The Valley draws guests into a whimsical oasis of colour, art and surprising hints of quirk, curated throughout its 103 rooms. CEO and Chairman of the Ovolo Group, Girish Jhunjhnuwala says Ovolo has invested approximately $55 million in adding a niche boutique designer hotel to Brisbane’s booming tourism and hospitality market. “There are many newcomers to the Brisbane hotel market, but Ovolo’s biggest point of difference is our exceptional customer service and design. We strive to exceed expectations and our rankings and customer feedback says it all. We are confident Ovolo The Valley will be a market leader for Brisbane in the near future,” Jhunjhnuwala said. “Our brief to Woods Bagot was that each of our hotels must have their own unique personality and style, inspired by local surrounds, culture, heritage and Ovolo’s playful, forward-thinking spirit, and they’ve delivered exactly that with The Valley. “There is an element of fantasy, escapism and play in The Valley. We’re positioning it as the perfect contemporary oasis to escape our busy urban lives,” said Jhunjhnuwala. 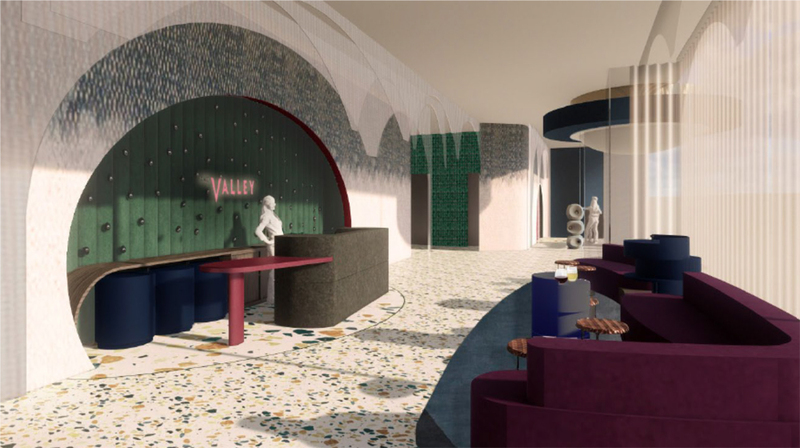 Woods Bagot’s Principal and Hotel Sector Leader (Australia), Bronwyn McColl, says the design of Ovolo The Valley celebrates Fortitude Valley’s eclectic mix: the rich colours of the streets and laneways, and its social and cultural diversity. At the same time, with rooms inspired by nature for a whimsical luxe experience, it provides an unexpected, private oasis for guests. 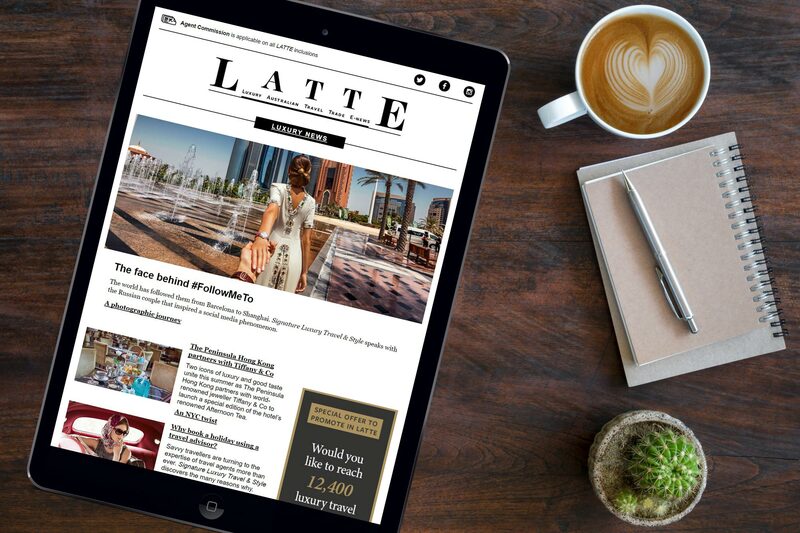 “With an eccentric mix of art, fashion, style and a whole lot of fabulous, we’ve created a new personality in Brisbane’s hotel market. We started by exploring the spaces behind The Valley’s indiscernible facades and the spaces in between, and translated them into playful, yet sophisticated, experiences that take the Ovolo guest by surprise, including the most incredible rock star suites in honour of the late David Bowie, with 1970s-inspired velvet lounges and a gold bar, for those who dare!” said McColl. 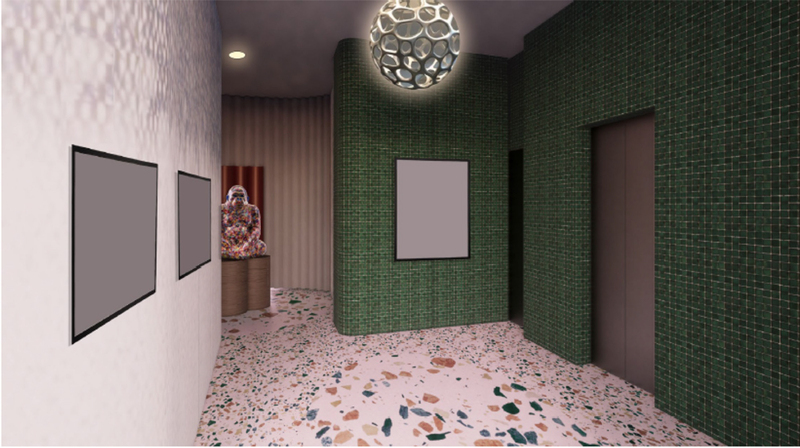 The interior design for the new hotel’s 103 rooms focus on creating a whimsical oasis for guests, replete with playful and colourful elements and commissioned art pieces including custom wallpaper and eccentric furniture and illustrations. Ovolo’s effortless living ethos is no stranger at The Valley, with 24-hour room service, large flatscreen televisions, Google Chromecast, additional wall plugs, phone chargers in rooms and Amazon’s Alexa cloud-based voice service, able to assist guests with just about every command. A rooftop swimming pool, gym, sauna, meeting rooms and Ovolo’s signature standard inclusions – free breakfast, free Wi-Fi, free in-room mini-bar, free laundry and free happy hour drinks daily – make The Valley a distinguished luxury hotel experience. Food and drink is a big part of the Ovolo Hotel Group concept, with award-winning restaurants at its other Australian properties including Alibi at Ovolo Woolloomooloo (Sydney) fronted by restauranteur Matthew Kenney; Monster Kitchen & Bar at Ovolo Nishi (Canberra); and Salon De Co at Ovolo Inchcolm (Brisbane). The group recently opened Mister Percy at Ovolo 1888 (Sydney), a Mediterranean-style wine bar fronted by renowned chef Justin North. Rates start from $300 per night.